Government House is the oldest European building in the Northern Territory, surviving both WW11 bombing raids and Cyclone Tracy in 1974. Captain William Douglas chose the site for his Government Residence in 1870. 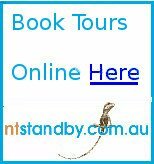 Since the first residence was completed it has been the home of successive Government Residents and Administrators and is recognised as an important part of Northern Territory history. 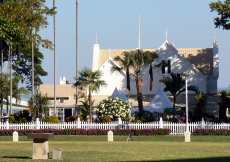 The residence was declared a Heritage Place in March 1996 and the Government House Foundation of the Northern Territory was incorporated on 11 December 1998 with the aim of preserving this heritage for future generations. The foundation also aims to promote public education and awareness of the history of the House and the role of The Administrator. 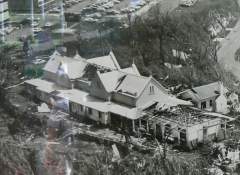 A photo showing the damage caused by cyclone Tracy in 1974 contrasts with the attractive appearance of a well maintained building today. The buildings are surrounded by gardens which were established in the 1890's by John Knight and today are maintained by a team of three horticulturalists. Covering about 1.3 hectares of sloping ground, the gardens are continually evolving with an emphasis on the use of a diverse range of plants to suit the location. The gardens and grounds received a Civic Commendation from the Darwin City Council in June 1982 and in 1996 was awarded the Keep Australia Beautiful Garden of the Year and Best Government Department or Statutory Authority Project.